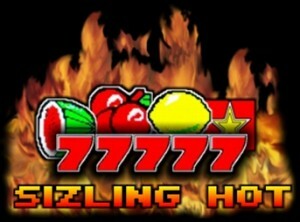 The Sizzling 6 Extra Gold Slot combines elements and features from three different Sizzling Slots. The extra bet 6th reel from Sizzling 6, the adjacent wins from Sizzling Gold while keeping the fruity design from Sizzling Hot Deluxe. The result, as you will shortly see for yourself, is an amazing slot game with many extra features with classic looks. Taking a closer look reveals an absolutely great slot game, with good win potential, fun features, and an Extra Bet feature that can be turned on or off. It's clear that Novomatic made no compromises and made good use of the tremendous experience they accumulated over the years. The attached video shows the basic gameplay in the Sizzling Hot 6 Extra Gold. Good parts from every successful release of Sizzling Slot were kept making a brilliant 3 in 1 online slot game. Click to play the game for free, opens in new window. The number of reels is flexible, meaning 5 or 6 reels can be set at any given point. This is done with the Extra Bet button that is placed on the top right corner in-game. Note! having the 6th reel enabled increases significantly the maximum win limits. A quick example, 6 identical winning symbols on a line will yield in 3000 credit win on a 1 bet. Disabling the feature lowers the maximum to 5 possible symbols on a pay line and 1000 maximum credit win. The next feature to talk about is the Golden Seven. In the Sizzling Hot 6 Extra Gold slot, this is the highest paying symbol. As a bonus feature, Novomatic made this symbol pay in adjacent reels. This means if Golden Sevens appear on reels 2, 3 and 4 or 4, 5 and 6 the player wins. Golden Sevens ignore the "from left to right rule" which is pretty nice. Amazingly the Gamble Feature, also known as Risk Game or Double Up was kept. The gamble feature tunes up, even more, the already broken win potential of Sizzling hot 6 extra gold. Getting 6 lemons on a line, then doubling up 5 times is now possible. Sounds pretty good right? There is no question that Extra Gold is one of the best slot machine games to play for free. The added extra features keep you entertained, winning the big jackpot also feels amazing. The extra content added gives this slot machine tremendous replay value. About 8 out of 10 slot games fail to provide entertainment and fun to users while playing for free. Sizzling Hot 6 Extra Gold offers 2 game modes essentially. The extra bet button can transform it from a 5 reels classic game to 6 reels feature-rich game in no time. On 21 August 2018, the time this article was written the most popular bonus was the one from Videoslots. A 100% up to EUR 200 on first deposit, 50 free spins, and 10 extra cash. Note, some countries are not eligible for this bonus. Belgium, Bulgaria, Czech Republic, Denmark, France, Italy, Poland, Portugal, Romania, Spain are all restricted. The next best option is Quasar Gaming's up to 800 Eur welcome bonus on first deposit. Important, the 800 also depends on the country of origin. For example, a player from the United Kingdom will receive only up to 300 Euros as a first deposit bonus.